SAN FRANCISCO—September 12, 2012—Apple today announced iPhone 5, the thinnest and lightest iPhone ever, completely redesigned to feature a stunning new 4-inch Retina display; an Apple-designed A6 chip for blazing fast performance; and ultrafast wireless technology*—all while delivering even better battery life. ** iPhone 5 comes with iOS 6, the world’s most advanced mobile operating system with over 200 new features including: the all new Maps app with Apple-designed cartography and turn-by-turn navigation; Facebook integration; Passbook organization; and even more Siri features and languages. 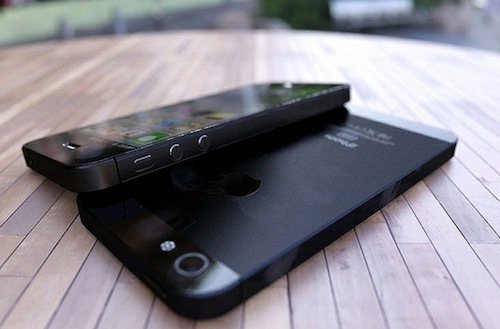 iPhone 5 is the thinnest smartphone in the world, with an all-new 7.6 mm anodized aluminium body that is 18 percent thinner and 20 percent lighter than iPhone 4S. Designed with an unprecedented level of precision, iPhone 5 combines an anodized aluminium body with diamond cut chamfered edges and glass inlays for a truly incredible fit and finish. iPhone 5 introduces new enhanced audio features including a new beam-forming, directional microphone system for higher quality sound, while background noise fades away with new noise canceling technology. iPhone 5 now includes support for cellular wideband audio for crisper word clarity and more natural sounding speech. Wideband audio will be supported by over 20 carriers worldwide at launch. iPhone 5 comes with the new Apple EarPods featuring a breakthrough design for a more natural fit and increased durability, and an incredible acoustic quality typically reserved for higher-end earphones. iPhone 5 comes with iOS 6, the world’s most advanced mobile operating system with over 200 new user features including: an all new Maps app with Apple-designed cartography, turn-by-turn navigation and an amazing new Flyover view; Facebook integration for Contacts and Calendar, with the ability to post directly from Notification Center; Passbook, the simplest way to get all your passes in one place; new Siri features, including support for more languages, easy access to sports scores, restaurant recommendations and movie listings;***** Siri and Facebook-enabled apps like Photos, Safari® and Maps; and Shared Photo Streams via iCloud. Previous articleNews: iPhone 5 costs $199 for 16GB, $299 for 32GB, $399 for 64GB – Pre-Order September 14, Ships September 21; iOS 6 coming!